Although CSUN men’s basketball’s guard Kendall Smith scored 21 points and forward Reggie Theus Jr. added a career-high 9, the Matadors were unable to complete a late comeback and fell to the UC Davis Aggies by a score of 71-68 at the Matadome on Saturday night. 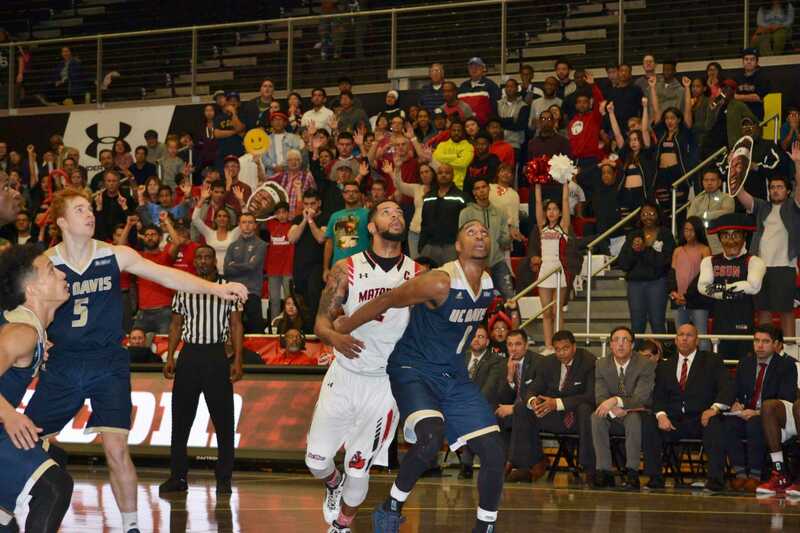 CSUN raced out to an early 15-4 lead behind eight early points from senior guard Aaron Parks. The Aggies battled back to trim the deficit to 31-30 at halftime. The teams traded blows to begin the second half before a three-pointer from Siler Schneider gave UC Davis its first lead at 42-40 with 13 minutes left. A small run by the Matadors saw CSUN take a 55-51 lead with eight minutes to play, but back-to-back contested threes from Darius Graham put the Aggies back on top. A crucial 8-2 run followed which saw UC Davis take a 67-61 advantage into the final minutes. Smith nailed a three-pointer and two free throws in the last 30 seconds of the game to close the deficit to one point, but missed an off-balance shot at the buzzer that would have sent the game into overtime. Despite the loss, the Matadors have still won four of five games and are tied for second place in the Big West with a 3-1 conference record. Theus Jr. has been encouraged by their play of late after a rough start to the season. Coach Theus was also happy with the effort displayed in the defeat. The Matadors get two days off before traveling to Hawaii to take on the defending conference champion Rainbow Warriors Wednesday evening. Tip-off is at 10 p.m.